KNOXVILLE—Contact and competition among different animals within a community matters when it comes to the possibility of parasitic disease outbreak, according to new research from the National Institute for Mathematical and Biological Synthesis and the University of Georgia, Athens. The study sheds new light on how parasites spread in animal communities comprised of multiple species, from rhinos to giraffes, lions to hyenas, birds to mice, and more. Parasitic diseases include influenza viruses, rabies virus, distemper viruses and hantaviruses. Risk of parasitic disease outbreak is either amplified or diluted depending upon the ecological context, according to the study published today in American Naturalist. 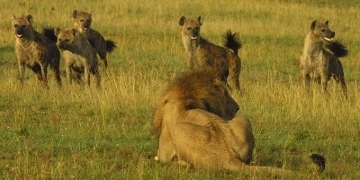 In some animal communities, for example, contact is high and competition is strong, which can be the case among hyenas and lions. In other communities, such as with ground kangaroos and tree kangaroos living in separate habitats, contact is low and competition is weak. Other communities are characterized by high contact and weak competition, such as in rhinos and giraffes, whereas in some communities, animals exhibit low contact but strong competition, such as with birds and rodents. Adding more species can either amplify or dilute parasite fitness and hence, the propensity for disease outbreaks. Previous theory has suggested that dilution of outbreak risk is likely to occur in systems with frequency-dependent transmission, which occurs when per-capita contact rates within and between host species are independent of population size. Previous theory also suggested that disease risk is amplified in systems with density-dependent transmission or when per-capita contact rates change based on population density. However, a novel finding of the study is that depending on the degree of contact between different species in the animal community and the traits of the hosts in that community, amplification of transmission can occur in frequency-dependent systems. Outbreak risk may increase as species are added to the community, if contact rates between different species are high relative to contact within the same species, which allows for more frequent opportunities for the shared parasite to spillover between different host species. The study also found that, in density-dependent systems, dilution can occur, especially in situations where competition between different species is sufficiently strong. Both transmission outcomes—dilution and amplification—are possible in all the ecological contexts examined in the study, except in the case where transmission is density-dependent and in situations where competition occurs only within the same species. Essentially, the study points out that increased disease risk in multispecies communities may have different drivers. "I think the important contribution of the research is that our approach makes strides toward a mechanistic framework for diversity-disease interactions. Contact patterns and competition need to be included as components of predictive models for disease-diversity relationships," said lead author Suzanne O'Regan, a NIMBioS postdoctoral fellow.